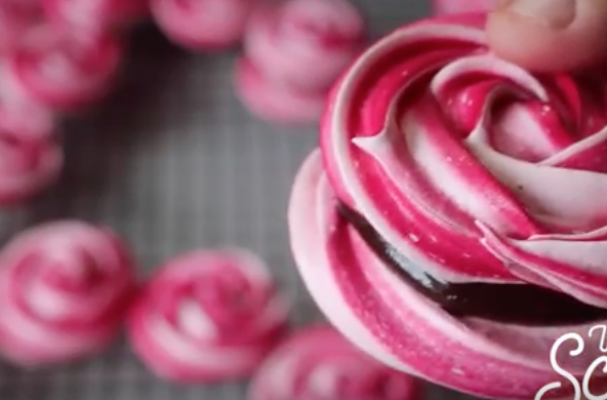 Instead of the usual bouquet of flowers or box of chocolates, bake mom a batch of these beautiful rose meringue cookies. Many beginner bakers are intimidated by this cookie because it consists mainly of egg whites and sugar but is really an easy dessert to prepare. The important thing to remember when preparing meringues is that you want to be extra careful when separating the whites from the yolks. Any traces of fat in the whites or in the mixing bowl will prevent them from whipping into those gorgeous white peaks. I like to separate my eggs using my hands because i find the the smooth edges of my fingers cradle the yolk with reduce the risk of breaking it. That being said, some people prefer using the egg shell or an egg separator. Another thing to keep in mind when separating eggs is that you will want to use three bowls: one for the egg yolks, one for the egg whites, and the last for separating the eggs. You don't want one bad crack to ruin the whole batch. Losing one egg white is much less devastating than losing four or ten. This wonderful treat will not only impress your mom but everyone who has the opportunity to see your homemade creation. For full recipe instructions, watch the video tutorial below.